4.2 What is the WEEE Forum? 6.2 How much WEEE is out there? 6.3 How do WEEE quantify and prioritise environmental impacts? 6.4 How much do WEEE have to pay? 6.5 How do WEEE benefit from impact assessment in policy development? 24.3 What are the issues for the WEEE recyclers? 24.4 What do recycling workers expect from this job? 24.5 What were the observations at the ECS Refining WEEE treatment site? Electrical and electronic waste is a growing problem as volumes are increasing fast. Rapid product innovation and replacement, especially in information and communication technologies (ICT), combined with the migration from analog to digital technologies and to flat-screen televisions and monitors has resulted in some electronic products quickly reaching the end of their life. The EU directive on waste electrical and electronic equipment (WEEE) aims to minimise WEEE by putting organizational and financial responsibility on producers and distributors for collection, treatment, recycling and recovery of WEEE. Therefore all stakeholders need to be well-informed about their WEEE responsibilities and options. While focussing on the EU, this book draws lessons for policy and practice from all over the world. Part one introduces the reader to legislation and initiatives to manage WEEE. Part two discusses technologies for the refurbishment, treatment and recycling of waste electronics. Part three focuses on electronic products that present particular challenges for recyclers. Part four explores sustainable design of electronics and supply chains. Part five discusses national and regional WEEE management schemes and part six looks at corporate WEEE management strategies. 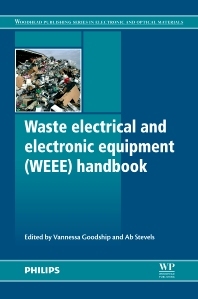 With an authoritative collection of chapters from an international team of authors, Waste electrical and electronic equipment (WEEE) handbook is designed to be used as a reference by policy-makers, producers and treatment operators in both the developed and developing world. Principal Research Fellow at the Warwick Manufacturing Group (WMG), a department at the University of Warwick providing research, education and knowledge transfer in engineering, manufacturing and technology. Her areas of specialism are plastics materials, their processing and recycling, and she has undertaken many research projects in these areas - most recently looking at multifunctional materials. She - like WMG - works at the interface of academia and industry. She has edited two books under the Woodhead imprint: Management, Recycling and Reuse of Waste Composites (2009) Waste Electrical and Electronic Equipment (WEEE) Handbook (2012). Ab Stevels has done trailblazing work in making Applied EcoDesign into day-to-day business really happen and has researched in detail the setting up of take-back and recycling systems for electronics For these purposes tools and management procedures have been developed which have proven their strength through their practical success. Ab is the author of some 200 journal articles and conference contributions. Training courses on applied EcoDesign have been held at various universities (Delft, Stanford, TU Berlin,TU Vienna, TU Ostrava, the University of Arts and Design in Farnham (UK) , Mexico City, Hong Kong Poly, NTNU( Trondheim, Norway), Tsinghua University (Beijing) , and at various Philips departments and divisions around the globe and at other companies. In 2013 he developed a 'MBA and Sustainability' course in cooperation with the University of Sao Paulo. For his work in Applied EcoDesign he got an honorary degree from the University of Arts and Design. For his contributions in the field of recycling of electronics he got the "Cowbell Award"from the International Electronics Recycling Conference Organization. In 2014 the World Green Design Organization awarded him a "Green Design Contribution Award'. Dr. Huisman holds a Master’s degree in Chemical Engineering from Eindhoven University of Technology and a Ph.D. from Delft University of Technology. He is a Scientific Advisor to the UNU – SCYCLE and steering the group’s research activities related to electronics recycling. He is involved in various international projects providing facts and figures for improving e-waste management. In the past, Dr. Huisman has been the lead author of the UNU study supporting the European Commission’s 2008 Review of the EU WEEE Directive as well as multiple advanced e-waste country studies for various European countries. From 2013 to 2015 he was the scientific coordinator of the EU CWIT-project: “Countering WEEE Illegal Trade” and currently also the H2020 project ProSUM: Prospecting Secondary raw materials in the Urban Mine. Currently with the European Commission DG Joint Research Center in the Sustainable Resources Directorate, Dr. Huisman is also the Director of OsevenfortytwO BV, providing worldwide consultancy regarding WEEE market development, product recyclability, WEEE compliance, ecodesign and policy evaluations for policy makers, recyclers and industry.